Many people believe that finish trim carpentry is a skill that is beyond their scope. The reality is that you've just not found the right place to learn it. Step by step, one nail, one screw, one tip at a time, we'll teach you finish carpentry. Having an understanding of all the trades involved with a remodeling project is essential. 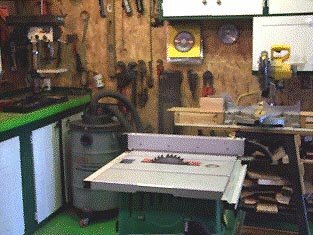 Trimming is one of those trades and knowing some of the tricks involved in finish carpentry can help out tremendously. We have experience and can help you to learn finish carpentry so that you can finish off your projects like an expert. This knowledge comes to you in the form of various step by step instructions for the different finish carpentry projects and many tips, tricks and techniques to make things go smoothly. Here are a few of the many quick tips available on the site and in the book to keep in mind while doing your trim work projects. The same type of wood species can have a broad range of color. The wood grains can vary quite a bit so matching your wood will give you a better uniform look. When trimming with hardwoods such as oak, maple or others, stay away from knots in the wood when nailing. If you shoot a nail in or near a knot you risk splitting the wood. Also nailing too close to the edge will result in splitting. I have found that casing my pre-hung interior doors on one side before installing the doors makes it much quicker and easier in most cases. Some times you can get these interior doors pre-cased from the store. Be sure to case the side which goes to the inside of the room. In finish carpentry to obtain those perfect measurements, set the wood in place and mark the wood. It's quicker and much more accurate then using a tape measure for the precise cuts at joints and miters. I only use my tape when it is necessary. This is particularly true when applying casing. Some of the best finish carpenters have a difficult time doing quality work if they are upset, mad, or depressed about something in their life. Here are a couple ways to try and get started on the right foot. In the morning before you begin working, take a shower, eat breakfast and put on some new shoes. Have a clear mind, be in a fantastic mood and you will be surprised at what you can accomplish. Focus is the key. Having the right tools for the project is also a huge factor for quality. Poor tools can some times produce poor quality. Poor tools can fuel aggravation. So be sure to buy or borrow the best tools you can. Make sure the saws have sharp blades, keep your pencil sharp, your knife sharp, your mind sharp and your work will be sharp. Remember - success doesn't come to you, you go to it. What Exactly Is Finish Carpentry? Building hand railings would be an example of advanced trim carpentry. We offer a very valuable E-book that will direct you through the process of building an interior wood hand railing. 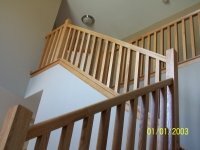 This handrail eBook is a must for saving time and money for an advanced trimming project that includes very expensive trim wood. For all the hand railing details covered in this book go to this page handrail e-Book. Using these skills and knowledge will benefit you in many ways and rewards will come in many different forms. People really appreciate the simple things, for example taking a few minutes and adjusting a door so it closes properly. After all you will know exactly how an interior door is installed and operates. By learning trim carpentry you are subconsciously learning many other things. You will be pleasantly surprised at what you can do and at all the different areas where these skills can be applied. That might sound like a commercial, but it is absolutely true. Most of the information on this site is free. Come in, look around, and take away some knowledge. Anyone can learn finish carpentry!